A wonderful kitchen in this beautifully remodeled condo is a treat. This condo has been newly renovated with hardwood floors, new appliances, and furnishings. You'll surely enjoy watching TV or DVDs on the extra large flat screen TV. 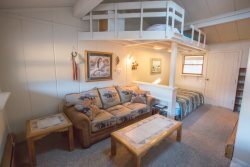 Condo A8 is located on the upper level with access to spacious outside decks and offers a great view of Sunlight Mountain Resort and the surrounding area. The main deck, hot tub, and ski slopes are just down the nearby stairway.